If you are looking for a quick and easy project to use this fall, try creating a creepy little spider with this easy-to-make Halloween craft. Handprint activities not only require very few materials, they become lasting memories of the little hands and fingers which created them. Here is a list of what you will need to get started. Before beginning the craft, you must first decide what material you want to put the handprint spider on. Construction paper is an obvious choice. For this, you can use regular craft paints. The spiders can be part of a larger Halloween scene, or the shape can be cut out entirely. If you decide to cut it out, consider attaching a magnet to the back or clear fishing wire to the top for easy hanging. Or, cut it out and attach it to a large “spider web” doily. 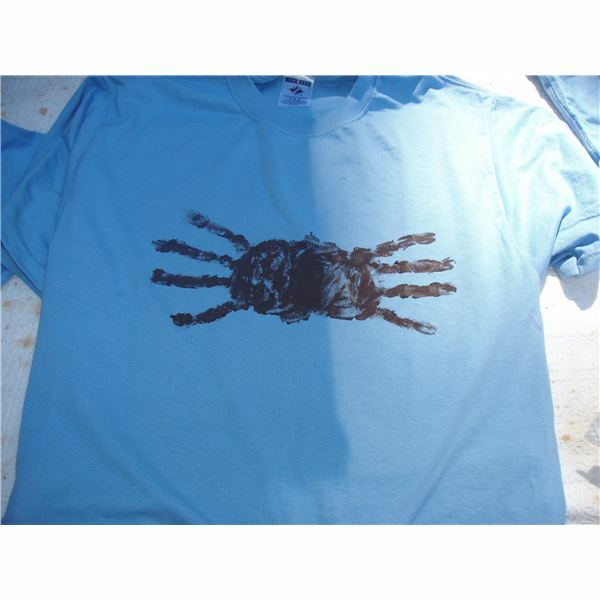 Another possible selection would be to use the handprint spider to create a unique Halloween t-shirt. You can even use it to decorate a plain tote bag which can later be used for trick-or-treating. If you choose to make something with fabric, you will need to use fabric paints, instead. You will also need to prepare the fabric according to the directions offered on the paint bottle. Begin by using one of the paintbrushes to paint both hands black. Do not, however, paint the thumbs. Be sure to paint all the way from the fingertips and down to the bottom of the palm. Stop before getting to the wrist. Position the left hand over the paper or fabric material so that the fingers are pointing to the left and the wrist is to the right. With fingers spread slightly apart, press hand down carefully but firmly, to create a handprint. Children, especially small children, may need assistance with this step and the next. The hand should be lifted straight up and off the paper or fabric, so that the handprint does not smudge. These steps will now be repeated with the right hand. Position the right hand, however, so that the fingertips are pointing out and to the right. The palm will overlap slightly with the palm from the left hand. Remember to lift the hand carefully from the paper or fabric when you have finished, so as not to disturb the image. Use the white paint on a brush to create small, circular eyes for your spider. Next, use the non-bristle end of a brush dipped in black paint to create a dot for the eyeballs. If you really want to be creative, you can use the brush and white paint to create a spider web for your handprint spider to sit in. Or, brush the back of a doily with white paint, and press it onto the paper or fabric to create the stamp of a spider web. The possibilities for this handprint Halloween craft are only limited by your imagination! For more handprint crafts, keep reading at Bright Hub!